Hi everyone I’m Corentin Itan, also known as icore. 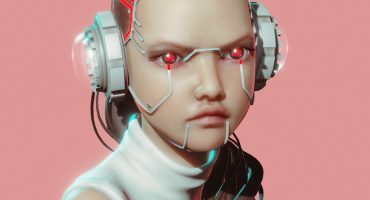 I am a freelance 3D artist from Montpellier in France. I’ve been interested in 3D Modeling since 2011, the year I started my degree In Graphic Design. After my studies I had the chance to work in a startup creating apps in 3D, in which I mostly worked in small VR scenery. After two years I decided to start freelancing as a 3D artist while working on personal projects like this one. I wanted to try a new art style since my last projects were mostly realistic. 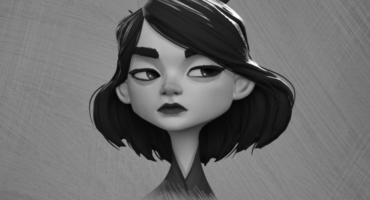 So I looked for a good stylized concept and found this concept from catell_ruz. I immediately fell in love with the idea of a maneki neko house and started to think about a small scene that could go well with this concept. So I created the basemesh in Maya using the old school Sub Division technique (and some small other tricks) to have a good idea of what the high poly would look like. For the slates on the roof I tried the newly implemented MASH plugin (Maya2018). It gave me a quick layout and I then tweaked them manually to add randomness. I also used a lot of booleans to rapidly create some shapes like the eyes and then cleaned up the geometry to have a nice smoothness. During this whole process I duplicated some of the basemesh (before any bevel) in order to use it as a base for my low poly. The second step of this project was making the high poly in Zbrush. Most of the pattern/cracks were created using the Orb Cracks Brush (a must-have) with Lazy mouse and then refined with Trim Dynamic, TrimSmoothBorder and ClayBuildup. The planks’ parts were created using GroupsLoops and then moving/inflating polygroups to create the large cracks. Most of the retopo was done in Maya using quad draw and some parts of the basemesh to speed up the process. The baking was done in substance painter using a cage and “matching by name” for a better result. The whole house is composed of one set of 4k maps. It was my first time trying to do a hand-painted style in Substance so I had to adjust my workflow. Since there is no color palette built-in in substance painter, I used multiple fill layers and painted in masks. It gave me a lot of control because I could change any color to fit the overall aspect of the scene. The principal problem of this technique is that the size of your project’s file tends to be a lot higher due to the amount of layers. The last step was to create a small scene. I thought of a story behind this house, thus came the idea of a slightly fallow garden. I created two textures for the ground in Substance Designer. The dirt texture is a mix of two shapes in a tile sampler, then modified by several warps and slope blur. The height map is then blended with some pebbles and small patches of grass. The grass is composed of two shapes plugged into three differents FX maps blended together. To get deeper into the explanation of the FX map, watch Vincent Gault’s tutorial on YouTube. I used Photoshop and Illustrator to create and paint the foliage texture, creating the basic shapes of the foliage with Illustrator and simply pasting it into Photoshop to add details. I then used the Xnormal plugin to create a basic normal map by blending different layers, each one with a new level of blur (overlay without blue channel). I rigged and animated the house in Maya (only two bones, one root and the arm). For the grass I skinned the top vertex of the grass patches to a single bone and animated it to fake the swaying. For the integration in Sketchfab I converted all my textures into jpeg (with max settings) to have a faster preview in the viewer without a huge loss of quality. I used different post processing filters : SSAO, Sharpness, Vignette, Bloom and Color Balance. 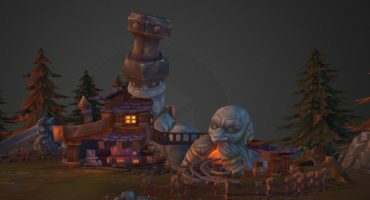 Finally I want to thank all the Sketchfab team for this amazing tool that gives us the opportunity to show our 3D projects so easily and with such quality and for allowing me to write this art spotlight.